Coffee is Uganda’s number 1 export and more than 20% of all its population earn their cash income due to the industry. Robusta first started growing here in 1860 in the lush, grasslands around Lake Victoria. Sharing the lake with Tanzania and Kenya, other major coffee exporters, it is evident that this area of East Africa harbours perfect conditions for growing coffee. The Arabica species was only introduced from Malawi in the beginning of the 20th century. The Kapchowra AA crop is grown around the foothills of Mount Elgon, an extinct volcano on the border of Uganda and Kenya. Mount Elgon was once the tallest mountain in Africa and is home to the famous Bagisu coffee farmers who hand pick the coffee carefully, removing any defected or unripe cherries. This coffee is grown in the shade along with bananas, which provide a staple food source for the community. Growing at 1300-2300 metres above sea level, the coffee has a fruity, floral note with hints of pear and a red wine lingering taste. 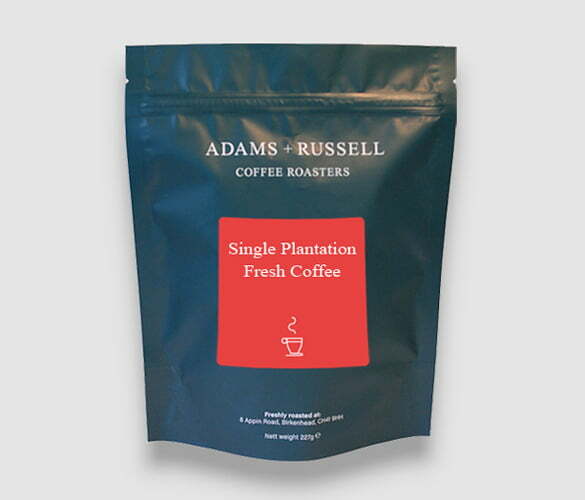 Adams + Russell roast the beans medium, and we think it’s great as a V60 coffee, this balances out the acidity and provides a clear brew. Perfect! The number of registered coffee exporters was 184, however only 10 of them are now still in existence. New entrants join annually with registrations ranging between 35 and 45. Other parts of the coffee industry joined the Association leading to the formation of Uganda Coffee Trade Federation. This was a difficult time for the UCTF and its members, with some of the major pillars of UCTF going out of business. Prices were at their lowest since 1991 as the coffee lost around 73% of its value. A consultant was hired to draw a three-year strategic plan for UCTF. Members have integrated backwards into production and are working with organized farmer groups, providing training, clean planting materials and supporting them in achieving certification with the aim of increasing production, productivity and improve quality. I visited this plantation back in 2010 and this was where I fell in love with real coffee. We prepared and roasted our own beans and had a few cups. The flavour is quite mild but that’s part of the reason I love it. Highly recommended.